WAMS supports the import of transactions to its Accounts Payable (AP) and Accounts Receivable (AR) modules. This feature is included with your program license. To import a file generated by your cotton software, run WAMS “Import Transactions” and simply select the file to read. 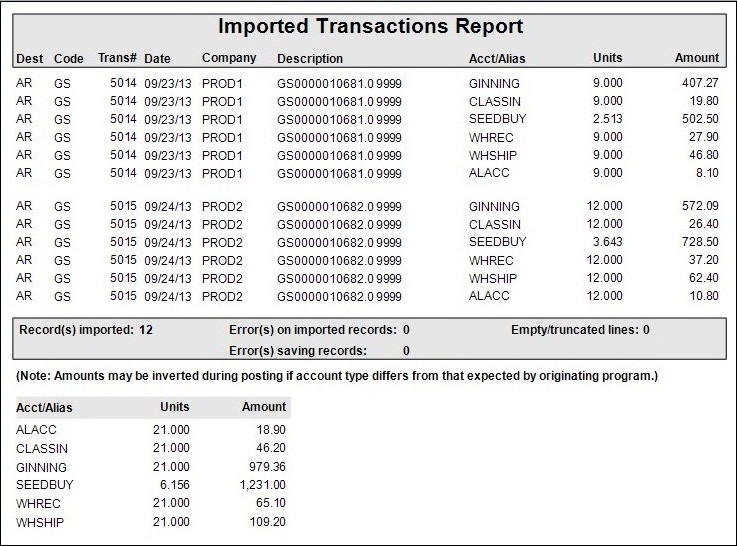 A report of transactions imported is shown including a summary by incoming token. Records without errors are immediately posted to the AP or AR modules. Records that have errors are suspended on this screen until you correct the issues (e.g. adding a missing alias/account) or you choose to remove them. Read more about WAMS or find out more about EWR, Inc.
WAMS uses the same import file format used by the older Ag Management System (AMS) provided by IDI\eCotton for many years. IDs for AP vendors and AR customers would generally match your cotton software producer/buyer/shipper IDs, but you can also define an “alias” to divert an incoming ID to a specific vendor or customer within WAMS. WAMS allows a single “company” record to be both an Accounts Payable vendor and an Accounts Receivable customer if desired. WAMS supports the “token” interface used in the cotton software. In the “Import – Account Aliases” option in WAMS you convert your cotton software “token” to a WAMS account ID (and optionally also a department, subcode, and/or category). For example, the token for “GINNING” might be converted to account “Gin charge revenue” and department “Cotton 2018”.